New and innovative biomaterials are being discovered or created in laboratories at an unprecedented rate, but many of them remain entirely foreign to practicing clinicians. This book addresses this gap in knowledge by summarizing some of the groundbreaking research performed to date on this topic and providing case examples of these biomaterials at work. The book begins with a review of the biologic background and applications of bone grafting materials utilized in dentistry. 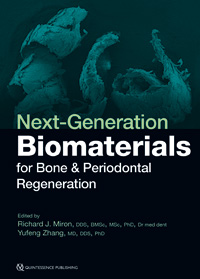 The principles of guided tissue and bone regeneration are covered in detail, including many recent advancements in barrier membrane technologies as well as use of platelet-rich fibrin and various growth factors, and many next-generation materials that will optimize future bone and periodontal regeneration are presented. The final chapter is designed to help clinicians select appropriate biomaterials for each specific regenerative protocol. Much like one implant size and shape cannot be utilized for every indication in implant dentistry, one bone grafting material, barrier membrane, or growth factor cannot maximize regenerative outcomes in all clinical situations. This textbook teaches clinicians how to utilize biomaterials in an appropriate, predictable, and evidence-based manner. Chapter 18. Next-Generation Bone Morphogenetic Protein 9: The Future of Bone Regeneration?